An extensive gut-renovation and addition to this property resulted in a shingle-style home with modern interiors that take full advantage of the water views. Collapsible doors make this interior bar part of the homeowners' exterior living. Custom touches such as grey cerused oak millwork, mercury antiqued mirrored backsplash and polished countertops add shimmer at night. This tiki bar is a perfect way to relax — from the walk-out basement onto the private pool/beach on Sasco Hill on Long Island Sound. 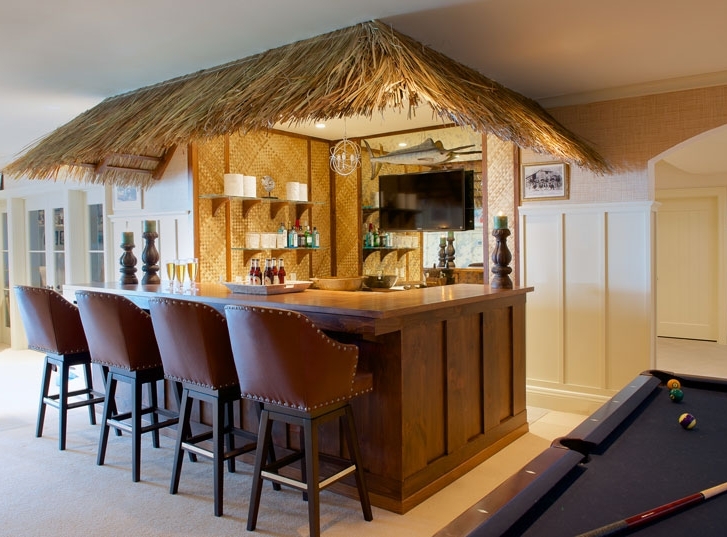 Straw thatched roof and banana leaf panels, support the custom mahogany bar. Billiards are close at hand. This waterfront home received an extensive gut-renovation and addition. 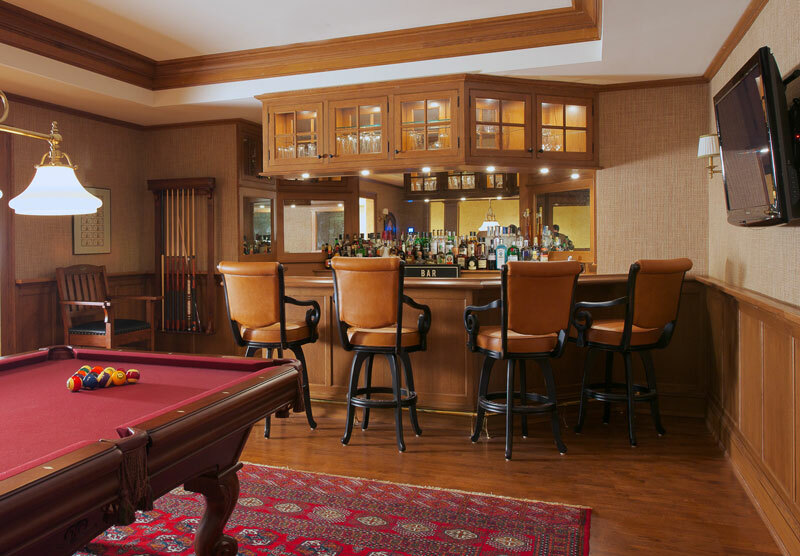 One of the homeowner's wishes was to have a billiards room and bar for family and company use. Located on the ground level — with views over Long Island Sound, the space takes advantage of its indoor/outdoor position. In this home's bar, custom quarter sawn oak was used for the bar and paneling as the foundation to support the walls clad in grass cloth. Antique mirrors line the back bar and the lighting in the cabinetry creates a sophistciated atmosphere. This home's previously unfinished basement was fitted-out with a sleek media room that opens to a billiard room with a wet bar (complete with beer on tap). The renovation included adding a powder room, gym and children’s playroom. Tile planked floors accentuate the custom bar while a banquette offers an alternative space for conversation. An existing unfinished space under the three car garage of this home was turned into a half-court basketball court with badminton and a rock climbing wall. Finishes include maple hardwood floors and walls clad in protective padding. 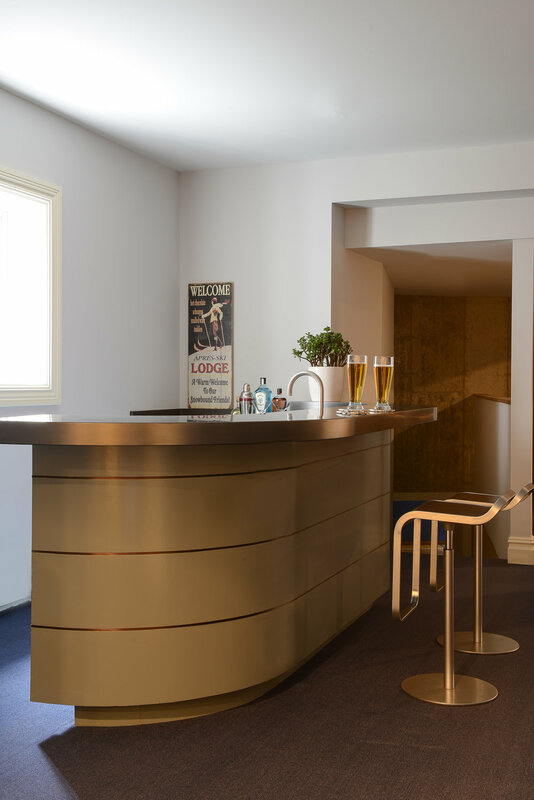 The large finished basement playroom was converted to a billiard room with a new contemporary styled curved wet bar. Features of the bar include a custom blackened stainless steel bar top with integrated sink and ribboning details on the bar surfaces.